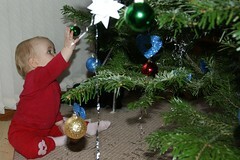 Anna and Amaia's blog: Why the hell have they put a tree in the living room? Why the hell have they put a tree in the living room? Adults just get weirder and weirder... On Saturday they only brought in a tree and it is currently taking up no less than half the living room floor. They keep hanging sparkly things on it and the game seems to be that they put them on, I take them off and leave them in a pile on the floor, and then they put them on again. It is a bit of a strange pastime but it seems to keep them amused so I am willing to keep at it if necessary.